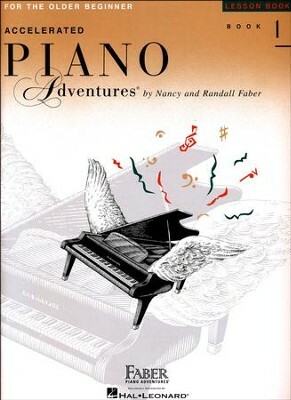 The Accelerated Piano Adventures: For the Older Beginner series is the perfect introduction to piano for students who don't need the cutesy-cartoons that often pepper beginning piano instruction books. 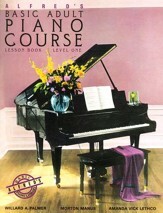 Each level has four books (each of which is sold-separately): Lesson, Theory, Technique & Artistry, and Performance. A piano method based on discovery, creativity and adventure through music, students will soon become acquainted with the great Classical musicians and plenty of additional enjoyable works. 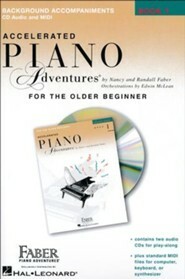 Accelerated Piano Adventures: For the Older Beginner Lesson Book 1 combines the Primer Level and Level One of the Basic Piano Adventures method. 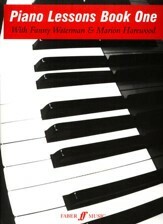 Concepts covered include: fundamental rhythms (including 8th notes), all the notes of the grand staff, C position, G position, and the intervals of a 2nd, 3rd, 4th, 5th and octave. 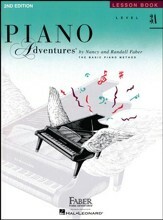 The Piano Adventures method teaches students through a step-by -step approach with constant review. Units cover a wide range of styles and lessons emphasize guide notes with new notes introduced gradually. Optional creative projects and Discovery questions that provide review are provided along the bottom of the page. 94 pages, softcover. I'm the author/artist and I want to review Accelerated Piano Adventures for the Older Beginner: Lesson Book 1.